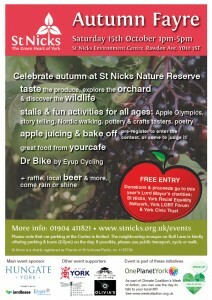 Can you help spread the word about event by downloading and forwarding this poster please? Your help would be much appreciated. More activities. stalls and details are being added as they are confirmed so do come back to check. Bake Off – this year’s theme is autumn’s bounty. You could be a judge on the day (for £5 you get a plateful of cake to try) or donate a cake/pie containing some British fruit – please get in touch by end of 10th October if you’d like to enter the contest and have a chance to win a prize. Confirmed entries into the contest so far include cakes from: Brunswick Cafe, Olivia’s Artisan Bakery & Cafe, Bicis Y Mas, Bistro Guy and the Good Food Shop. Climate Acts – share your tips for reducing carbon footprint and talk to the local MP Rachael Maskell (arriving around 2:3pm) about your concers over climate change (or any other). 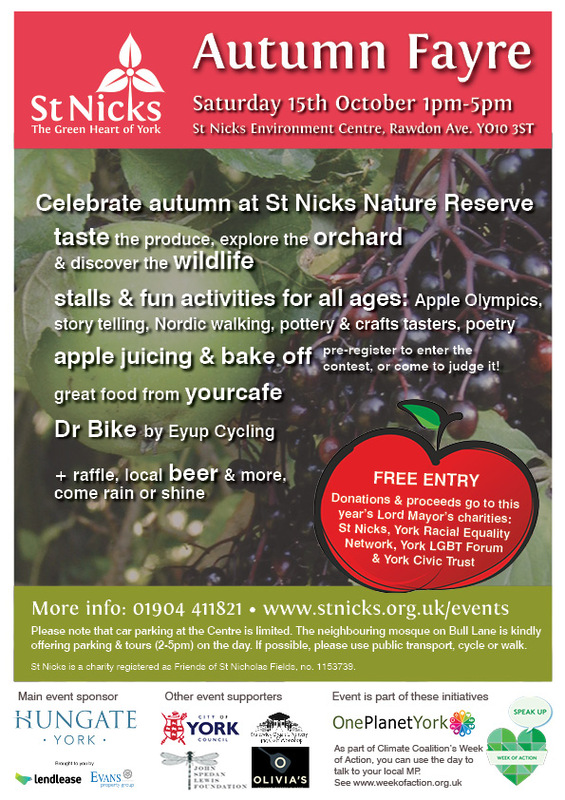 The event is part of the Climate Coalition’s Speak Up Week of Action to celebrate the people, places and things we want to protect from climate change, such as St Nicks. Join in and make sure MPs feel that love. Please note that car parking at the Centre is very limited. The neighbouring mosque on Bull Lane is kindly offering parking and tours of the new mosque (between 2-5pm) on the day. If possible, please use public transport, cycle or walk. Big thanks go to the main event sponsor Hungate York Regeneration, which is a joint venture partnership between Lendlease and Evans Property Group. Thanks also go to John Spedan Lewis Foundation for supporting out wildlife surveys. Thanks to Lord Mayor for supporting us this year!